Tag Archive | "final concert"
USA chanting with the K-2 students. 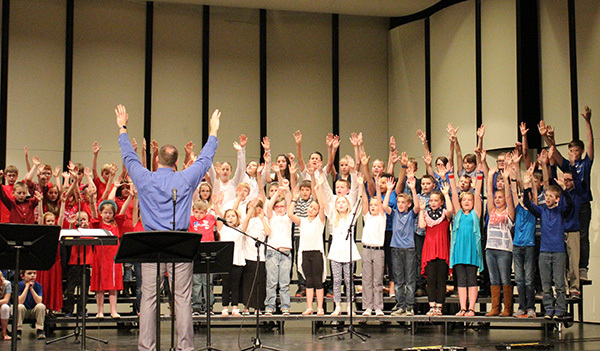 On Wednesday, May 3, CTA elementary students presented their final concert of the year. This concert was patriotic-themed. Students were dressed in a sea patriotic colors. All K-5 students started off the concert with the a salute to our country by singing the national anthem. K-2 students then energetically chanted “USA” to some music followed by a version of “Twinkle, Twinkle, Little Star” called “Twinkle, Twinkle, 50 Stars”. Other highlights of the concert included a bucket drumming ensemble, a recorder ensemble that played “My Country ‘Tis of Thee”, an xylophone ensemble, and some students rapping the 50 states in order. Everyone enjoyed the patriotic theme and students enjoyed the unique aspects of the performance.